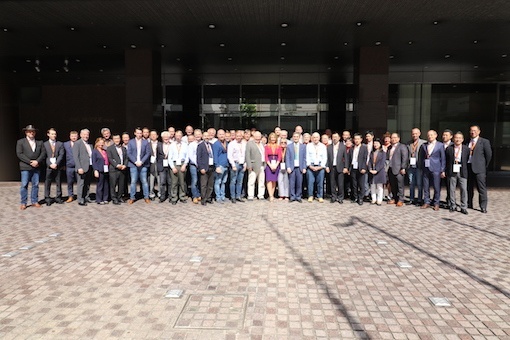 The IACDS convention saw some 100 delegates from all over the world in attendance, with two large delegations from Sweden and the host nation Japan standing out. Sponsor of the event was the Austrian manufacturer Tyrolit, with exhibitors being the Japanese manufacturers Shibuya and Hakken, Pentruder from Sweden, Hilti from Liechtenstein and CreteBeater from Denmark. 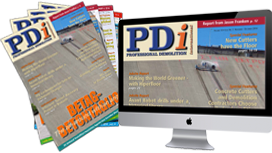 Media partners were UK’s Concrete Cutter, Betonbohrer, Concrete Openings and PDi Magazine. The organiser was as usual IACDS, this time in cooperation with JCSDA (Japan Concrete Sawing & Drilling Association) in partnership with the national concrete cutting associations of Spain, USA, Germany, United Kingdom, Sweden, France and Switzerland. The first day of the conference started with a visit to Dai-Ichi Cutter Kogyo k.k. premises in Chigasaki, Kanagawa prefecture, located south east of Tokyo. The IACDS delegates had a great day with a clear sky and a lot of sun, with the majestic Mount Fuji volcano being easily spotted on the way to Dai-Ichi. On arrival, the group received a presentation on the company by its president Mr Takahashi. The guide of the tour was Mr Watanabe who enlightened the delegates in excellent English. Dai-Ichi is celebrating their 50th anniversary this year, and is currently one of the world’s biggest, if not the biggest, concrete cutting companies, with a turnover of €87M, and an average profit of some 10%. Listed on the Tokyo Stock Exchange, the company employs currently some 360 people that work out of 11 branches including the head office. During the visit, the IACDS group saw demonstrated how road sawing is carried out in Japan. Due to very strict regulation, all slurry created during the road sawing needs to be contained and recycled by using special road saws that extracts the slurry, which is then recycled at special stationary recycling plants or by using mobile equipment. The clean water is reused, while the left over concrete is deposited. After an interesting day at the Dai-Ichi Company (a more complete presentation of Dai-Ichi will be published in PDi 4-2018) the day continued back at the convention hotel in Tokyo with a workshop headlined “Service Design”. Later in the evening a welcoming cocktail reception was held at the hotel, with a welcoming speech by IACDS president Julie White. The following day had a packed program starting with coffee and networking at 8.00am. At 9.00am the conference sessions started with Joel Vinsant, UK Concrete Sawing & Drilling Association, who spoke on the subject, “Monitoring health and safety issues for the workers of the industry”. Erin O’Brien from the US Association, CSDA, then spoke about how to employ younger people, the ‘Millenials’, and how we can attract them to the industry. Cota Fujio made the last speech before a well-earned coffee break, speaking on behalf of the JCSDA on a large concrete cutting project in Tokyo where a train and subway station were renovated and rebuilt. After the break, Brian Wnuck from Canadian contractor Westcoast Cutting & Coring, made a presentation on a major renovation project of a power plant. (Please read the separate article about the project on pages 56-57 in this issue). Jun Ozawa from the Japanese association and the Japanese contractor firm, Concrete Coring Co ltd Osaka, spoke regarding the work being undertaken within the JCSDA. Martin Braun from Braun Machinenfabrik presented different methods for dismantling nuclear power plants. (PDi will publish a separate article later this year about what products and equipment Braun offers for dismantling in nuclear environments). Directly following the Braun speech, Michael Findeis and Reiner Schulze presented the universal quick coupling for core bits than can simplify core drilling. Bernhard Brehm, from Dr Bender, developed the quick coupling system. There is no patent on this smart quick coupling system, meaning that other manufacturers are able to produce it in order to make the daily life easier for concrete coring companies. The conference day continued with lunch and networking, with delegates having the opportunity to visit the exhibitor area next to the conference room. In the afternoon, the IACDS general assembly was held. Julie White welcomed everybody and the secretary, José Blanco from Rabuso, presented the minutes from the last meeting. Currently IACDS has in total 23 members, comprising of seven association members, 11 suppliers, three single contractors and one press (PDi). It was discussed that the Australian association is about to merge with the association in New Zealand, with Julie White pointing out that discussions about membership are taking place with China, Australia, Denmark and Russia. The current market situation for the concrete cutting industry was discussed and each member association presenting updated figures, with the German market being particularly buoyant. The rates on numerous jobs have increased, with no signs of recession. The association now employs three people, and has an annual budget of €600,000, to service the requirements of its 600 members. Additionally, a new concrete cutting museum is to be opened in Hamm with dust, and in particular silica dust, being a big issue in the country. Sweden reported also reported a current thriving environment. However jobs rates have decreased due to several ‘fortune seekers’ active in the market. Also affecting market conditions are the upcoming elections in September. The Swedish demolition and concrete cutting contractors have merged into one association, with this working well, with 101 members coming from concrete cutting. Over the years Sweden has had many members, and was once the third biggest association worldwide. Currently numbers have not increased at the same rate and several other national associations have caught up, and in some cases surpassed Sweden, which is now in fifth place shared with UK. In the US, the economy is improving, with one major issue being finding competent workers, with one solution being the recruitment of retired armed forces veterans. USD$1.5B has been set aside for renovation and infrastructural project, which will create a number of new jobs. Today CSDA has 530 members including suppliers. Although the association now has good membership levels, it did report that it has become expensive for contractors and manufacturers to adapt to the silica rules in the country. In Canada the concrete cutting industry is booming in the western parts of the country, although, and as in the US, it is proving hard to find skilled staff, with skilled cutters being at a premium, with Brian Wnuck, ending, “We are in the dam business” (see Ruskin Dam article previously mentioned). Austria is booming, with job rates increasing, with the major problem again being the lack of experienced staff (the IACDS reached out and urged Austria to become a member again of the association). SNED from France reported that they believe business will return to good levels in 2019. There is a great deal of work in the Paris area, and several new projects will be undertaken during 2018 and 19. As in many other countries staffing is proving challenging, with the shortage of trained workers leading to many unqualified staff being used on projects. The United Kingdom is also experiencing good market conditions, performing far better despite Brexit. The market has seen a number of acquisitions, with a reliance on a largely eastern European workforce particularly the London area, who tend to move from one company to another as jobs start and finish. The association has today 101 members increasing by 10% over the last year. The market in Switzerland is not actually booming but is still good. There are 110 members in the association, and about 400 in total in the whole country, which is very good considering the size of the Swiss market. Of interest is the fact that the Swiss association now offers a three year long training program for concrete cutters. The Spanish market continues to grow as more construction projects are undertaken; the Spanish concrete cutting association now has some 20 members. The Japanese association has 50 members, which includes 34 contractors and 16 suppliers, releasing its own magazine twice a year. The association holds 10 meetings annually with a focus in the association on all forms of concrete cutting including core drilling, wall sawing, flat sawing, road sawing and wire sawing. Safety is given a high priority, although training is not, but those contractors that train staff receive a specific certification. In recent years Japan has suffered several natural catastrophes, with a recent large Tsunami on the east coast resulting in the collapse of the Fukushima nuclear power plant. The Tsunami caused 16,000 fatalities and there are still 25,000 people missing. How to demolish the Fukushima plant is currently being investigated but as yet nothing has been decided on. It is estimated that it will take up to 40 years to re-establish the nuclear plant. Japan is quite a long country, over 3000km, and a large number of building and infrastructural constructions are aging and are in need of renovation. Most Japanese bridges were built in the 1950s and 60s, and are in a need of repair, with there being over 700,000 bridges in Japan. As of today, the renovation work has not yet really began, thus the association is expecting quite a lot of work in the coming years. Providing added impetus is that in 2020 Japan will be holding the Olympic games in Tokyo, meaning that a great deal of infrastructure preparation for the games will be undertaken, benefitting members of the association. During 2018 some €1,3T is to be spent on public works, with €6,8T being set to be invested in government and private construction projects to the end of 2020. The Japanese market is about to boom, but as with many other countries, the recruitment of experienced staff is proving to be problematic. It was decided that next IACDS convention will be held in conjunction with the Bauma exhibition in Munich on Sunday 14 April. A special networking session will be held on Thursday 11 April in the afternoon, where the IACDS Diamond Award ceremony will also take place. In 2020, the meeting will be held in Italy, and for 2021 the plan is to visit Australia and New Zealand. The IACDS board elections are scheduled to take place at the next meeting in 2019, with Norikazu Shibuya (who was awarded honorary membership of the IACDS) and Philippe Wingeier, both announcing their intention to leave the board in 2019. The meeting voted that Friedrich Braun from Braun Machinenfabrik, will take a place on the board, together with someone from the US association. A new president will also be elected in 2019. In the evening a formal Japanese style dinner was held at the Tokyo Shiba Toufuya Ukai restaurant located next to the Tokyo Tower in Shiba Park. On the following day a sightseeing tour was organised for the participants, with the group visiting the famous Meiji-jingu Shrine, the National Diet Building (Japanese Parliament) the East Garden of the Emperors Palace, the Asakusa Kannon Temple and finally, the group took a river cruise visiting the new and modern Odaiba Island. In the evening a formal dinner was hosted by the Japanese association in the Mielparque Hotel, with excellent food and entertainment being provided. All together the conference was a fantastic gathering and a credit to the IACDS association. Special thanks go to the Japanese national association, and in particular Norikazu Shibuya, his family, and staff of the Shibuya Company.